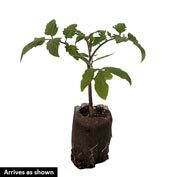 Red Marble Tomato | Gurney's Seed & Nursery Co.
Closely related to wild tomatoes, these vigorous hearty plants are nearly indestructible—and they produce lots of currant-sized, sweet-flavored tomatoes that are perfect for snacking, salads and cooking. In our field trials, the Red Marble plants showed exceptional performance. The healthy, disease-free plants produced loads of tiny (smaller than cherry tomatoes), red fruits with a very sweet, cherry tomato flavor. Indeterminate. 70 DAYS. Fruit: Red currant-sized, sweet-flavored tomatoes. 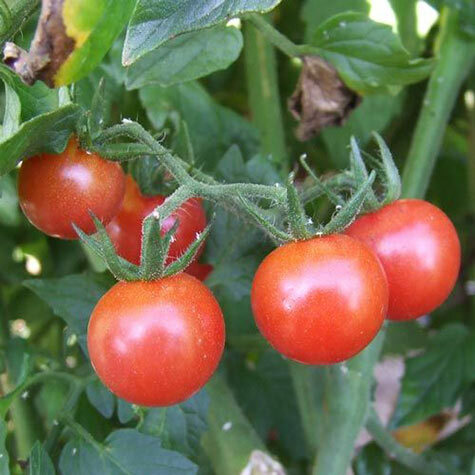 Comments: Closely related to wild tomatoes, these vigorous hearty plants are nearly indestructible-and they produce lots of currant-sized, sweet-flavored tomatoes that are perfect for snacking, salads and cooking. In our field trials, the Red Marble plants showed exceptional performance. The healthy, disease-free plants produced loads of tiny (smaller than cherry tomatoes), red fruits with a very sweet, cherry tomato flavor.